A blend of riesling from Tasmania's east coast and the Tamar Valley combined to make a fresh and fruity style that is easy to drink without knocking your socks off. 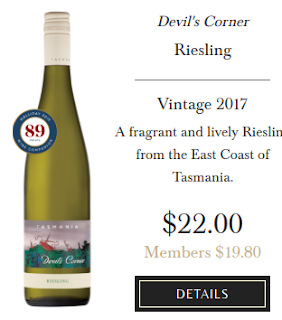 $22 a bottle on the Brown Bros (they are the Devil's Corner owners) website although I paid a few dollars less at my local. The Owl rated it an 85.